Oil on canvas: 34 x 40 in. 86.4 x 101.6 cm. Among the influences on Lingelbach, according to Kren, were the mature work of Jan Miel from the late 1630’s and 1640’s, and the classicizing influence of Michael Sweerts, who arrived in Rome in 1646. 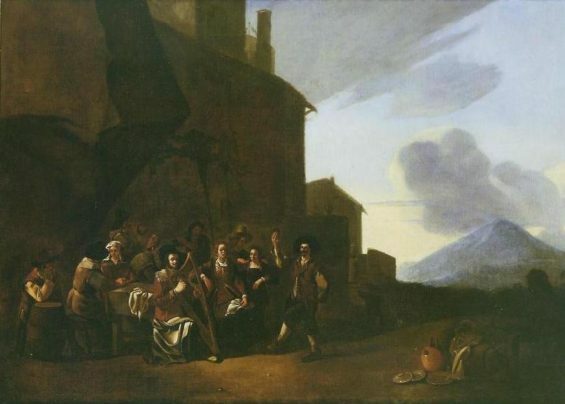 Another seminal work of Lingelbach’s early career is The Purgative Source, (Musee Fabre, Montpelier), where Kren states that “the distant…mountains at the right are treated with even colouring and flat light.” This treatment is certainly evident in the landscape of the present picture, which also features the wide-brimmed hats of the peasants enlivening the surface design…and the doll-like male figures mentioned by Kren. I am writing to enquire about "Figures carousing, playing the harp and dancing outside a Neapolitan tavern, Vesuvius in the distance"